7 January or 25 December? In the Holy Gospel of St. Matthew, the Magi appear as "wise men" guided by a star from the East to Jerusalem where they sought out the new born King of the Jews. Coming from the East denotes the magi are outside of Israel. Scholars seem to think the Magi perhaps came from the banks of the Tigris and Euphrates, where astronomy was cultivated early by the Chaldeans. The Israelites seem to have devoted little study to astronomy. Many Israelites it is thought believed the study of stars would encourage idolatry of star worship. Therefore there was no abundance of knowledge related to the study of stars among the Israelite culture. Regular patterns of travel of the stars and planets were sufficiently known to produce a calendar with the dates of holy days and festivals. The star appearing in the days of Herod the Great of Judea (37-4BC) was a new star appearing for the first time. And only this one time did it appear. Frequently called "the Star of Bethlehem," this star was definitely an unusual brilliant celestial body that captured the attention of those who followed it. Bethlehem was a town some five or so miles south of Jerusalem. By the time of the birth of the Lord Jesus Christ, Bethlehem the once famous City of David, had become an obscure village. Bethlehem is first mentioned in the Holy Bible as being located near the burial place of Rachel and was called Ephrath (Genesis 35:19). Bethlehem was the home of Boaz who married Ruth. It was home to Jesse, David's father (I Samuel 16). It was prophesied in the Old Testament that the Messiah would be born in Bethlehem (Micah 5:2). Herod the Great's priests reminded him of this prophecy and the wise men were sent to look for the Child in Bethlehem (Matthew 2:1-8). Origen the Scholar states, "The star that was seen in the east we consider to have been a new star, unlike any of the other well-known planetary bodies…Yet, it had the nature of those celestial bodies that appear at times, such as comets…It has been observed that, on the occurrence of great events, and of mighty changes in earthly things, such stars are apt to appear, indicating either the removal of dynasties or the breaking out of wars…There is a prophecy of Balaam recorded by Moses to this effect: 'There will arise a star out of Jacob, and a man will rise up out of Israel." In the Old Testament Balaam was one of the Magi predecessors, a Gentile who also anticipated the coming of a King among the Jews. Why would wise men follow this most famous star seeking to worship a King not from among their own religion but instead from among the Jews? The answer may lie in the fact that the religion of the wise men was similar to the Jews. Originating from Persia, the magi believed in one God, did not worship idols, and worshiped light as symbolic of God. It was expected from the ancient of times that a great king would rise up out of the Jewish population. A child from Heaven would come who would restore the golden age to the Jewish nation. This expected child documented in ancient literature would take away all sin. The prophet Daniel was a prince and chieftain among this particular class of magi or wise men. Through the Holy Book of Daniel, Daniel's prophecies and calculations of when the Lord Jesus Christ should be born were made known to the wise men that followed the star. Origen stated the "star was not any of the constellations existing in the sky that was made to be the star of the East. Rather, it was something of another order, appointed for this purpose and in the service of the knowledge of Jesus." The Holy Gospel of St. Matthew further alludes to the Old Testament prophecy that "a star shall come out of Jacob and a scepter shall rise out of Israel." (Numbers 24:17) The reference to a star in ancient time signified a god or deified king. What exactly did the Bethlehem star signify? It signified the extraordinary importance of the birth of the Christ Child. The star followed by the wise men was a sign of the Messiah Himself, signifying the true light He was certain to shed upon the world. St. Ignatius of the first century tells us regarding the birth of the Lord Jesus Christ, "How, then was He manifested to the world? A star shone forth in Heaven above all the other stars. The light from this star was inexpressible, and its uniqueness struck men with astonishment." The worship of the infant Lord Jesus Christ following His Holy birth by the Magi was symbolic of the Church. As it has often been said, the Church, the true Israel determines its membership by faith and not by ethnic lineage. 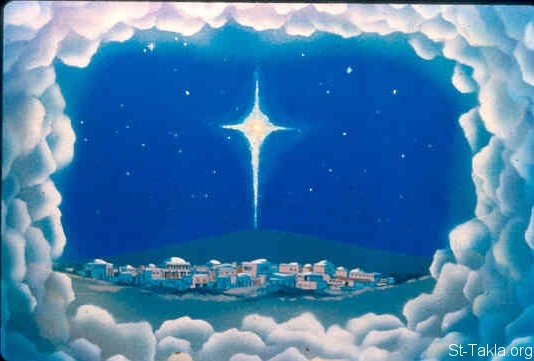 The wise men received knowledge of the newly born Lord Jesus Christ through observation of a star. It is interesting to note that the chief priests of the temple in Jerusalem including the high priest who alone can enter into the Holiest of All (Hebrew 9:7) had no idea that the Messiah had been born and where. God in His infinite wisdom revealed His Truth to those with a noble and good heart earnestly seeking to worship Him. The Lord Jesus Christ revealed by an astoundingly brilliant star that had appeared only one time from the East is our everlasting bright and morning star (Revelation 22:16). May the faith of the three who followed the star from the East abide in us all.